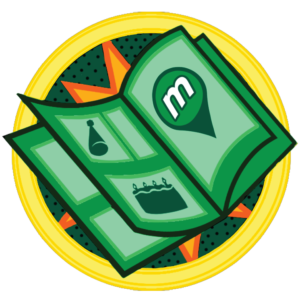 It’s hard to believe that it’s already been six years since Munzee was launched. It’s surpassed anything the co-founders could have imagined as a game, company, and community. As you probably have noticed, we tend to celebrate, especially our birthday. So take a peek at what we have going on for our Spectacular 6th Birthday! Like most 6 year olds, we love comics and superheroes so be prepared to cap special comic books! Starting tomorrow (July 1st) at 00:01 MHQ time, 2011 Spectacular 6th Birthday Special icons will be on the map. These icons will bounce on greenies every 6 hours or when captured. When captured, these will scatter three onomatopoeia icons within one mile for two hours or until capped. Each of these are worth 17 Capture points and 11 CapOn points for the host owner. You CAN capture these on your own greenies, and all four specials will count towards the new Specials Badges line. The scattered icons will also have another surprise. Each of the three icons will award a different badge. Your goal is to collect all three. Earned by capturing the BAM! icon. Earned by capturing the POW! icon. Earned by capturing the BANG! icon. When you collect all three of the badges, you will also earn the completed comic book page. Earned by capturing all three of the scattered icons. These icons will be on the map until July 31st at 23:59 MHQ time. They will also be available in the Munzee Online Store during the month starting tomorrow. Throughout the month, other items will be on sale, so keep an eye out for more information on those! As always, keep an eye on our social media pages for prizes, giveaways, and contests. We hope you enjoy Birthday Month. We know we will! We’ve brought back the podcast/videocast! With a lot more space for fun activities in MHQ 3.0, we’ve set up an awesome podcast studio! We figured we should probably get around to using it though, so what better time than for some Birthday Month announcements? We had a few technical difficulties at the beginning (give us a break, it’s been a while since we’ve done this!) but the audio quality gets a lot better about 40 seconds in. Swap out your old virtuals using our new Virt Swap tool. 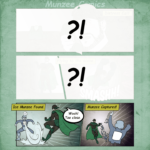 Munzee Version 3.3.3 is now live. Update now. Some super sick badges for capping seasonal specials. Holy spectacular sixth Birthday Batman! Comic book birthday specials are coming your way! Super Louise -with the speed of a locomotive- is going to be a bit busy in July. New emerald gardens are popping up worldwide. 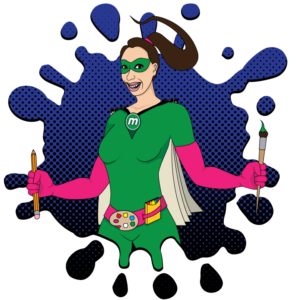 Superhero Birthday events and MHQ’s Birthday Bash. Rob and Matt’s July event travel schedule. Flat Rob and Flat Matt activation dates. Agents, due to your hard work in June the contaminated outlier strain of Evolution Munzees has been controlled. Despite investigations into what caused the issue, there have been few leads as to who was behind the leak. ZeeOps Agents must focus on forward though, so prepare for this month’s Operations. Since the leaders of the Mean Green Gang have seemingly all been eradicated Director Zee has kicked off a probation program for former MGG members. The program has been named “Going Green.” He has requested that ZeeOps agents worldwide begin rounding up Mean Greenies to present them the opportunity to join forces. The program has been met with some resistance from both ZeeOps agents and former Mean Green Gang operatives though, so be careful. July ZeeOps Operations are now live and you can begin planning your Missions to start on the following day. You can plan your Operations at munzee.com/ops/ and purchase more ZeeCred in the Munzee Online Store. You can also track your Missions in the new Munzee app update. Greenie-ology I- Capture at least 20 greenies. Greenie-ology II- Deploy at least 15 greenies. Going Green – Capture at least 20 greenies and deploy at least 10 greenies. Green With Envy – Deploy at least 25 greenies. Not So Mean – Capture at least 35 greenies. Growing Green- Capture at least 100 greenies. Green House Games- Deploy at least 50 greenies. Gone Green- Deploy at least 100 greenies. The Dictator – Capture at least 150 greenies and deploy at least 50 greenies. Resistance – Deploy at least 100 physical munzees of any type. Missing Zee- Capture at least 250 physical type munzees. With Birthday month right around the corner we have a new app update that has been released! Munzee 3.3.3 has been pushed to the Apple App Store and the Google Play Store. – We’ve added an in-app ZeeOps dashboard to track your operations. – The main menu now features accompanying icons for all entries. – Badge details now show the original description even after a badge has been earned. – The coin discover request popup will now only show as toast message (transparent at the bottom) when not on the coins page. While the app has been made live in the app stores, there may be a delay in the propagation to your area. Please be patient if you don’t see it yet. Check out the video below to see some of the new features! We’re excited to announce the release of a new line of badges for capturing special seasonal munzees! Nearly every month we release new limited time specials and we want to award our players for capturing these year round! In the past we have released hoverboards, groundhogs and much more so always be on the lookout for new, unique specials. The Specials Badges are now LIVE and you can start earning them when the next special is released! These badges will NOT be retroactive, but moving forward every new seasonal special we release will count. They may not be totally retroactive, but these badges will include all captures from the World Turtle Day specials that went out in May. 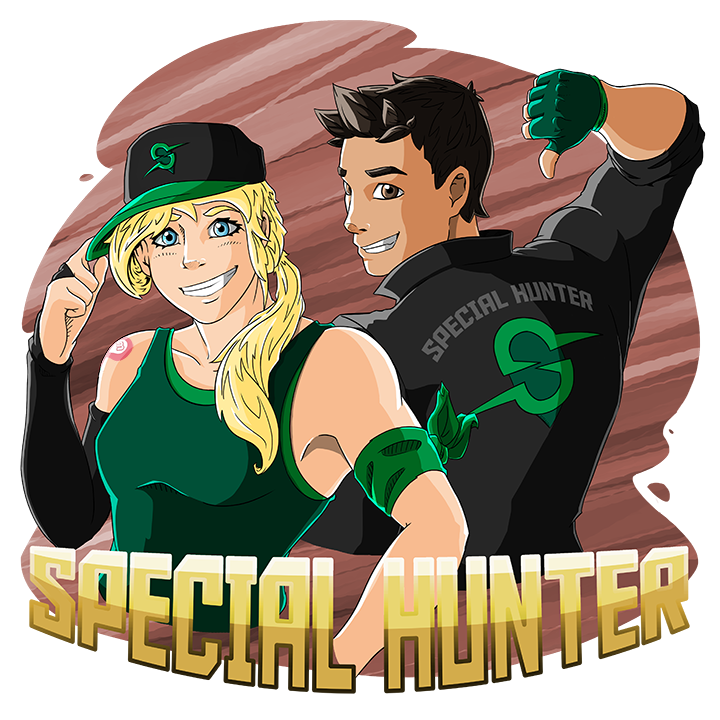 Special Hunter- Capture 10 Munzee Specials of any type. Wouldn’t it be great if you could easily swap out old virtual munzees in popular destinations for newer virtuals worth more points? Well now you can! We’re excited to announce that you can now easily swap out many virtual munzees! 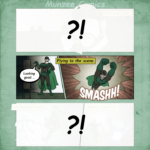 Using the Munzee website you can now go back to your older virtual type munzees and swap in new virtual types and MVMs. By using the Virt Swap tool, you can instantly archive your old virtual type munzee and deploy the new one in the exact same spot. No waiting periods and no losing your spot! This also opens up the opportunity for players to re-capture high density areas, if new virtuals are deployed. For example, you can swap an old green virtual for a new virtual sapphire in the exact same location. You could also swap an old yellow mystery virtual for a new MVM and add a yellow color credit. It’s good as new and ready for people to come and cap it! Imagine the cap on points you will receive with the strategically placed MVM versus the old virtual points. Please note that when you swap out an old virtual you must use a new munzee that has not been previously deployed. Since you’re swapping out for a totally new munzee the points for the old virt captures will not change. To celebrate the release of this new tool MVMs are on sale for $4 and for every MVM purchased you’ll get a free color credit as well. 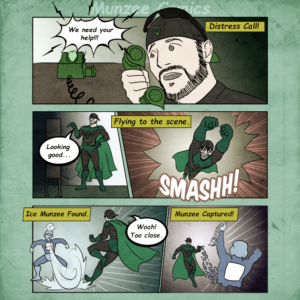 Go to the Munzee Online Store and stock up now! Go to your online Munzee profile. Go to your undeployed munzees and copy the number code from the replacement virtual item URL. Go to your deployed munzees and choose the virtual you want to replace. Click “Edit Details,” scroll down and paste the new number code in the specified area. CLARIFICATION: ALL (physical and virtual) Jewels count for Caps and Deploys, and CapOns DO count toward Total Points. Hey, everyone! Sorry for putting out these requirements a bit late. It’s been a bit hectic around MHQ lately. June is almost over, though, so here are the July Clan Requirements! No, we haven’t lost our minds (yet) ;). We know we are actually early in releasing the Clan Requirements this month. We’ve got a lot of cool things to announce this week, so we decided to post these a bit early to keep a good flow of information. Good luck with the July Clan War! 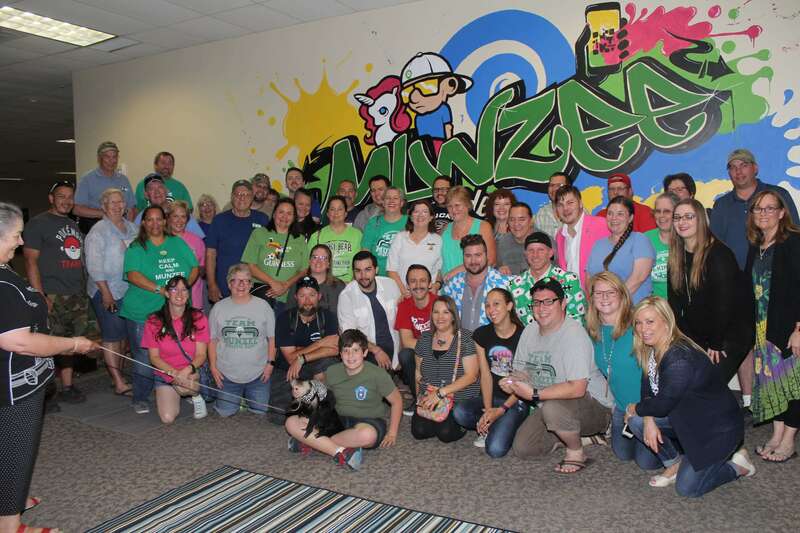 Meet Munzee: Dylan’s New Office! The all new MHQ is up and running! We understand that everyone can’t make it to Texas to visit in person though. So to embrace our 2017 theme of “Everyone. Everywhere.” we’re hosting a series of video interviews with staff members about their new offices. Check out Munzee and Eventzee Director of Creative Operations Dylan Derryberry’s new office! To learn more about Eventzee check out https://www.eventzeeapp.com/. Hello from a swelteringly hot London! I hope you’re all getting excited about July and all the 6th Birthday events. There are 80 on the calendar to choose from! It’s not too late to get your events on there, it’s quite late for artwork though, our designers’ diaries are full to bursting and we can only accommodate pretty simple requests for July at this stage I’m afraid. Trish has recently finished the badges for attending and hosting, they are SUPER! Here is a sneak preview for you. There are 4 host badges up for grabs, the Super Scott, Super Matt, Super Trish and Super Dylan. I’m on the Attendee Badge and there is an icon featuring Super Rob for everyone who goes to a Birthday event and captures the Event Indicator Pin. 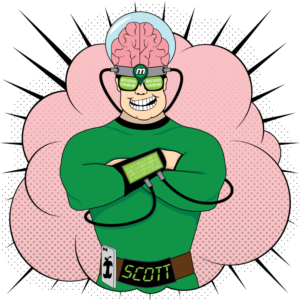 Super Scott!- Earned by hosting a $30 Birthday Event package. 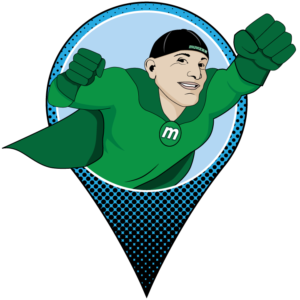 Super Matt!-Earned by hosting a $35 Birthday Event package. Super Trish!- Earned by hosting a $135 Birthday Event package. 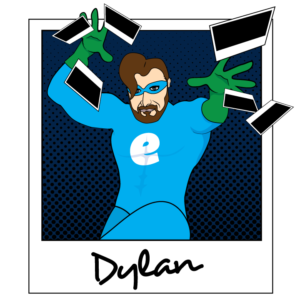 Super Dylan!- Earned by hosting a $185 Birthday Event package. 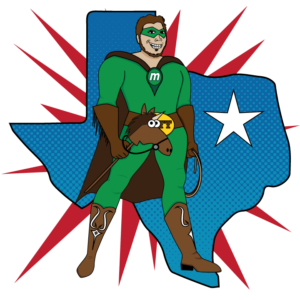 Super Rob!- Earned by capturing an Event Indicator Pin at a Munzee Birthday Event. Don’t forget that Dan the Man will be giving freebies to all attendees when they capture the event badge if the host has opted for that $20 extra and there will be surprises thrown in for all Birthday events as per usual, don’t miss out, plan your event today! Stay safe and Munzee On! We love it when players choose to visit MHQ. To give you the best experience possible, we would love for you to let us know in advance. This is especially the case if you are traveling long distances and have a limited time to visit MHQ. To ensure you have a great time visiting us, we have set up a Google Form that can be found here and on our contact page. After filling out this form (which contains contact information and date/time of visit among other things), you will be contacted by Teraca (our Director of HR) to confirm your visit as well as let you know any pertinent information. If there is a conflict with your request, she will try and work out a solution with you. 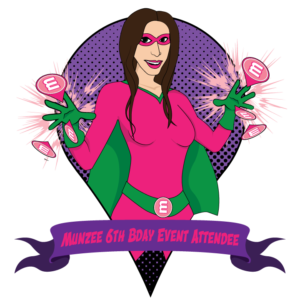 **Please note that it is not necessary to fill out this form when attending official MHQ events found on the Munzee Calendar such as our 6th Birthday Event or MHQ Bash. 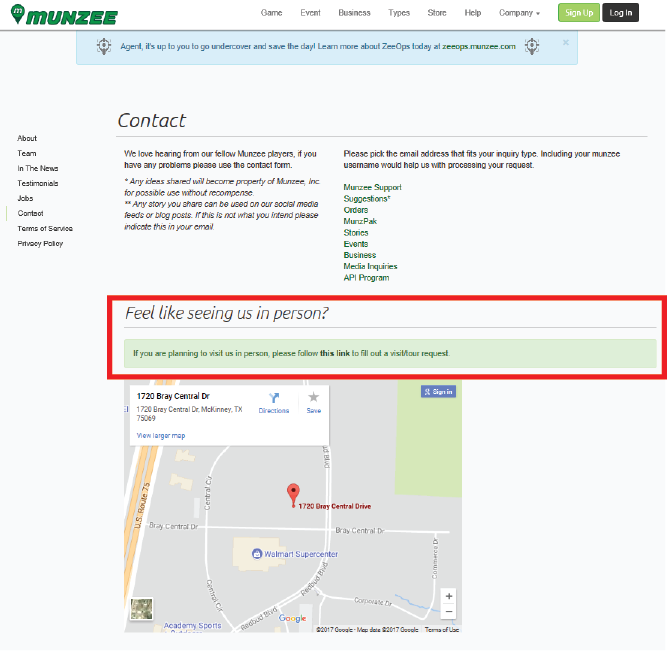 The on-site Munzee store is also open anytime during our work hours, so this form is specific to those players who are interested in a special tour/visit. We’ve had players from all over the world visit MHQ, and we can’t wait to meet more people. Schedule your visit today!